The Latvian Chairmanship of the CBSS Civil Protection Network – the State Fire and Rescue Service of Latvia, in cooperation with the CBSS Secretariat, the Swedish Institute, EUSBSR Policy Area Secure and Riga Stradiņš University, hosted the Baltic Leadership Program (BLP) in Civil Protection Alumni outreach event and conference “Societal security in the Baltic Sea Region – Challenges and Solutions”. 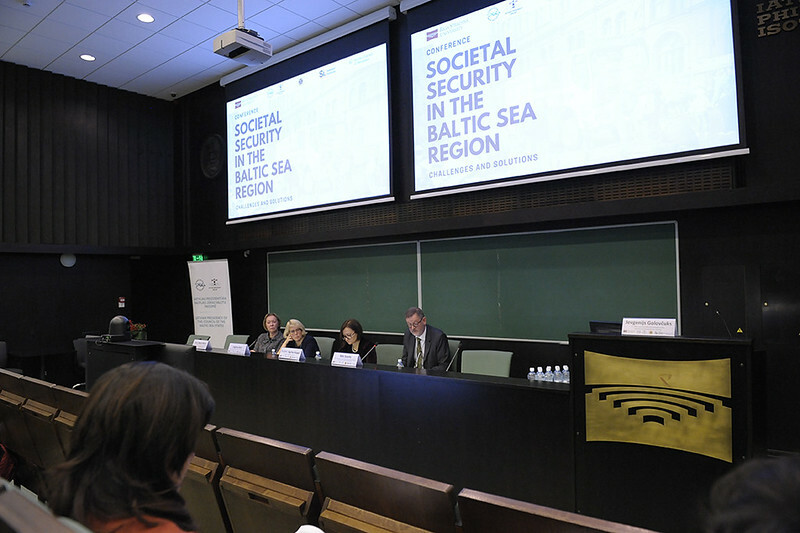 The conference was held 26 – 27 November 2018 in Riga, at Riga Stradiņš University. During the event, which was – in the BLP tradition – designed as a mix between theory, practice and networking, 60 participants from 11 countries listened to distinguished speakers and panelists and engaged in interactive workshops. Moreover, the course covered different perspectives on societal security: from the social anthropology view on risk perception to a gender-responsive DRR concept and a live demonstration of Augmented reality (AR) for use in public awareness raising campaigns. In interactive workshops, the participants discussed education and awareness raising while their ideas were captured by a professional graphic designer creating a blueprint for awareness-raising campaigns on citizen resilience for the Baltic Sea Region. The welcome address for the conference was given by Dr. Agrita Kiopa, prorector of Riga Stradins University; Ms Inguna Aire, Deputy State Secretary, Ministry of the Interior of Latvia; Ambassador Maira Mora, Director General of the Council of the Baltic Sea States Secretariat, and Mr Nils Svartz, Former Acting Director General of Swedish Civil Contingencies Agency, Senior Advisor to the Director General of MSB. A guest lecture on common societal security was given by Ms Kristina Syk, CEO of Straterno AB, Sweden. The conference had two panel discussions titled ‘Education as a Core Element of Societal Security Culture’ and ‘Regional Awareness Raising: A Tailored Approach’. The panel discussions were followed by workshops on the same topics. Concluding remarks were given by Professor Bengt Sundelius – Strategic Advisor at the Swedish Civil Contingencies Agency (MSB). On behalf of the CBSS Secretariat’s Civil Security team, we sincerely congratulate our Latvian colleagues from the State Fire and Rescue service for organising such timely and educational event. This BLP event builds on past programmes from 2014 to 2017: offering a unique opportunity to share experiences and best practices among peers, acquire new knowledge and enhance leadership skills through the combination of theory and practice. It helps the participants increase their institutional knowledge and strengthen the ties between the agencies, that are playing a central role in crisis management in the BSR. The BLP in Civil Protection is also a strategic instrument that empowers future decision-makers in the field of civil security to challenge conventional approaches to emergency and crisis management, thus promoting comprehensive regional mechanisms and achieving the objectives of the Policy Area Secure (PA Secure) within the EU Strategy for the Baltic Sea Region (EUSBSR). Next module of the Baltic Leadership Programme will take place in Denmark, and will be organised by the Danish Emergency Management Agency (DEMA) in November 2019.